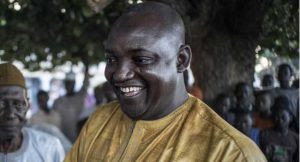 The Gambia’s president-elect, Adama Barrow says his shock win of the country’s general election heralds new hope for the country. Incumbent leader, Yahya Jammeh, an authoritarian president who ruled for 22 years, has confirmed that he will step down. 51-year-old Mr Barrow, who has never held political office, won Thursday’s election with 45.5% of the vote. Hundreds of Gambians took to the streets to celebrate one of the biggest election upsets West Africa has ever seen.